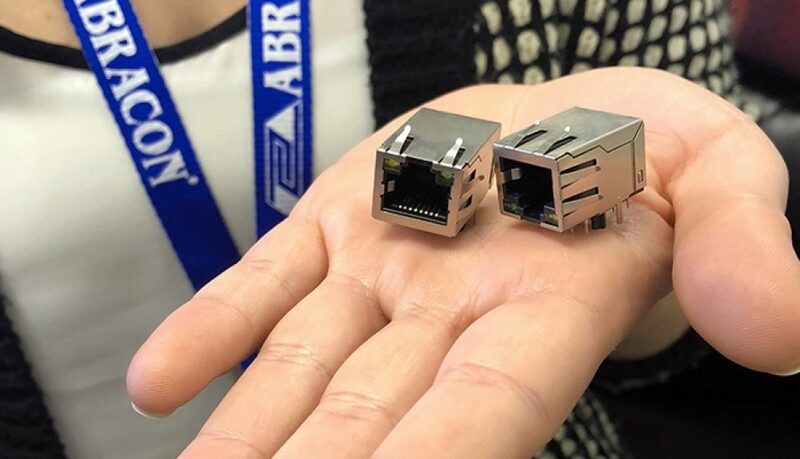 AUSTIN, TX – Abracon, LLC (Abracon), a leading global manufacturer of frequency control, timing, synchronization, RF, connectivity and power component solutions announces the availability of the ARJM11 RJ45 jackswith integrated magnetics targeting a broad set of applications including emerging 5GBase-T, 2.5GBase-T, 1000Base-T and 10/100Base-T data rates. Ideal for low port count applications such as IP cameras, surveillance, IP phones, industrial monitoring, medical monitoring, test and measurement, instrumentation, IoT, set top box, storage and servers – these connectivity solutions offer a broad variety of configurations including LED placement, shielding options and paste-in-hold (PIH) or pin-in-paste (PIP) options. These options provide maximum flexibility in new and existing designs. With low minimum order quantities, the ARJM11 RJ45 series enables system designers to deploy their products in the market as fast as possible. All standard configurations are available in stock through Abracon’s major distributors. Founded in 1992, and headquartered in Spicewood, Texas, Abracon is a leading global manufacturer of passive and electromechanical timing, synchronization, power, connectivity and RF solutions. Abracon offers a wide selection of quartz timing crystals and oscillators, MEMS oscillators, real time clocks (RTC), Bluetooth modules, ceramic resonators, SAW filters and resonators, power and RF inductors, transformers, circuit protection components and RF antennas and wireless charging coils. The company is ISO9001-2015 certified with design & application engineering resources in Texas and sales offices in Texas, California, China, Taiwan, Singapore, Scotland, Israel, Hungary, UK, and Germany. Abracon’s products are offered through its global distribution network. For more information about Abracon, visit www.abracon.com.